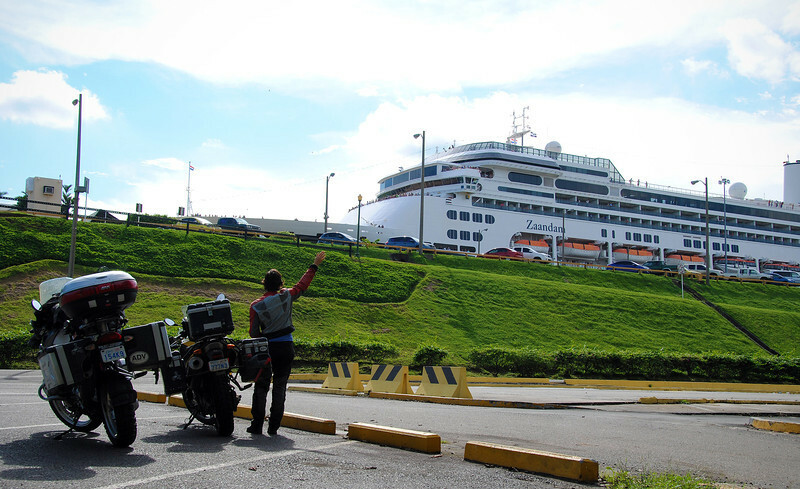 One morning, we rode out to visit the world-famous Panama Canal - or at least the Miraflores Lock, one of the three locks that comprise the Panama Canal system. It's the southern-most lock, about 15 minutes away from Panama city and is the first lock that ships go through when they approach from the Pacific Ocean. 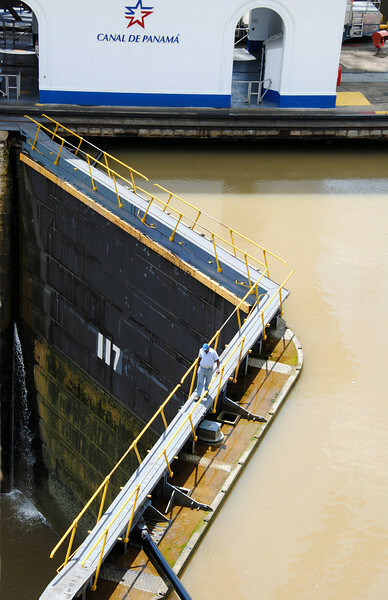 There are two other locks in the 80-km long Panama Canal: the Pedro Miguel lock, within visual distance of the Miraflores, and the Gatun Lock, which is closer to the Atlantic Ocean. I heard an interesting comment the other day about how geopolitically, South America starts at the border between Panama and Colombia. However, geographically, the continents are physically separated by the waters of the Panama Canal, so anything south (uhm... east) of the canal could be considered South America. And that includes Panama City! So really, we've been in South America for quite a while now! You can watch ships traverse through the double locks of the Miraflores from a multi-storey visitor's centre. An announcer on the loudspeaker tells us interesting facts about the canal while we wait for each ship to line up, get pulled into position by tug boats and then small locomotives on either side of the canal. There are two lanes so two ships can cross at the same time. Canal passage costs are dependent on the size, weight and cargo of the ship. Private yachts typically pay $1000-$2000, whereas the largest shipping commercial ships and tankers will pay up to $150,000! Even though the tolls are high, ships save two weeks of sailing time by not having to travel around the tip of South America, at a savings of $1,000,0000! The lowest toll ever paid was by Richard Hallibuton in 1928. He swam across the Panama Canal and was charged according to his body-weight: 38 cents! The maximum size ship that can pass through the Panama Canal is 106 ft wide, 950 ft long. Ships that approach this limit but do not exceed it are called Panamax ships. Newer ships that exceed this size are called Post-Panamax ships. In 2006, the Panama Canal announced new plans to build a third lane with larger dimensions to accommodate post-Panamax dimensions. The new standard, dubbed New Panamax, will be 180 x 1,400 ft! A football field only measures 160 x 360 ft. You'll be able to fit 3.5 football fields end-to-end comfortably in each New Panamax lock with lots of room to spare. That's insane! We spent the entire morning just watching ships go in and out of the Miraflores Lock. It's an astounding engineering feat accomplished on such a grand level. You never get tired of watching it. I just found out that the Panama Canal is considered one of the Seven Wonders of the Modern (Industrial) World. No surprise! But you can cross the Miraflores and Pedro Miguel in two minutes! 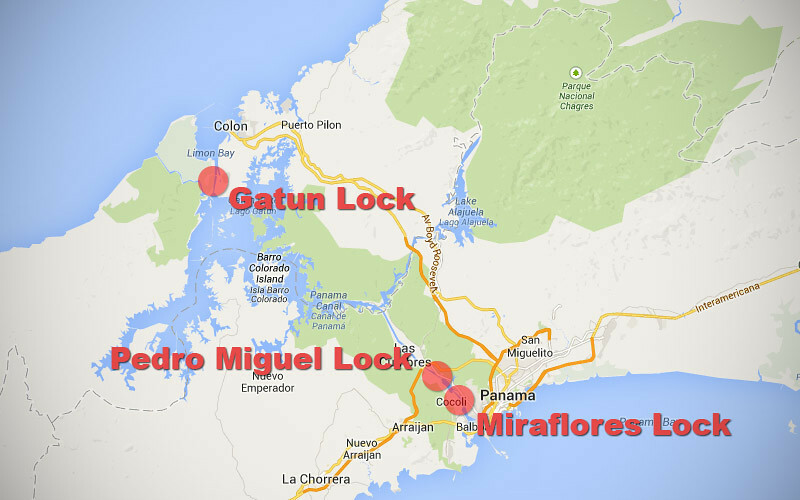 In the video above, the ship is traveling north from the Pacific through the double-locks of the Miraflores first, and then through the single lock of Pedro Miguel. Although it takes 8-10 hours to make the complete crossing from ocean-to-ocean, you can't just show up as spots are booked up for at least a week out. Some vessels book one year in advance!